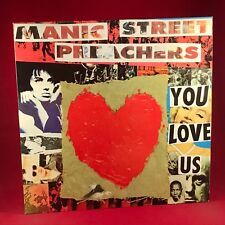 Manic Street Preachers - Postcards From A Young Man 7” Vinyl In Ex condition. Please take a look at the other vinyls we are selling. We will no longer ship to Brazil PAYMENT WITHIN 2 DAYS PLEASE. The condition of the sleeve is Excellent with only a very minor corner dink (as shown in the last photo) and both sides of the vinyl are Excellent plus. 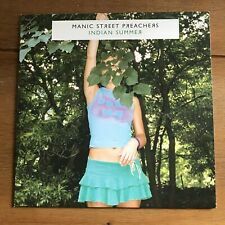 Manic Street Preachers - Indian Summer 7” Vinyl In Ex condition. Please take a look at the other vinyls we are selling. We will no longer ship to Brazil PAYMENT WITHIN 2 DAYS PLEASE. Pressed on the Heavenly label with the catalogue number HVN 10. The condition of the one sided 7" W/L is Excellent plus and the sleeve is Excellent with only a very tiny minor corner crease. Also includes a photocopy of a letter by Richey stating it is a Rare W/L radio edit. Little Baby Nothing 7" (UK 1992) : Manic Street Preachers. Has Dermont Audio Ltd etched into the blank side. Has Manics handwritten on the blank side of the label which is unusual as most issues of this release had Manics stamped onto the label. The condition of the vinyl is Excellent and plays through perfectly. Some Kind Of Nothingness : Manic Street Preachers. All etchings correct and original from 1991 rare heavenly white test pressing vinyl. original test pressing from the manics. Disc & sleeve are in excellent Condition, showing only the most minor signs of use. 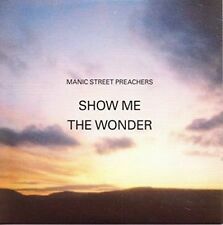 Manic Street Preachers-show me the wonder / t.e.lawrence.7"
The condition of the sleeve is Near Mint and both sides of the vinyl are Near Mint. SCULPTURE OF MAN. 7" VINYL PICTURE SLEEVE. SLEEVE & VINYL - VERY GOOD CONDITION. Record gradings are as follows B SIDE - WHAT HAPPENED TO THE BLUE GENERATION. The only exception to this is 'AA' sides. Catalogue No. 658382 7. Label: Columbia. Planet Earth Records is run by Records Collectors for Record Collectors. Year: 1992. LIFE BECOMING A LANDSLIDE. CAT NO; COLUMBIA 660070 6 1993. 12 " VINYL SINGLE. THE VINYL IS IN EXCELLENT CONDITION. "International Blue". Side A: International blue. Grading as per UK Record Collectors' system. Record: 'EX'. Labels: 'EX'. Manic Street Preachers-show me the wonder / what happened to the blue.7"
Side A: She Is Suffering 7" Mix. MANICS MOTOWN JUNK Rare 1st UK pressing of their 12" three track limited Heavenly pressing with the catalogue number HVN812. The condition of the sleeve is Mint as New and both sides of the vinyl are Mint and remain Unplayed. Please see the photos for more details plus a full track list. 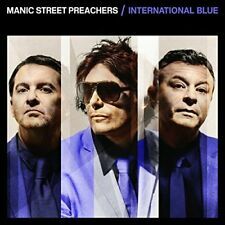 Buy with confidence as I have a 99.8% positive feedback rating from 3000 music fans, mainly from fellow Manics collectors. Check out my other Manics items including more Signed rarities etc. I will combine shipping costs on multiple purchases and refund once the items have been posted. Will be sent in a 12" cruciform mailer with two card stiffeners. Posting within the UK is by 1st Class Signed For. Worldwide shipping is by Tracked Or Signed, or both depending on your country. Thanks for looking. The condition of the sleeve is Mint as New and both sides of the vinyl are also Mint and remain Unplayed. A very rare test pressing of the 1991 Heavenly Records debut release. released on Heavenly Records HVN1012 in 1991. on very rare original UK white label test pressing 12" in paper sleeve with handwritten white paper labels. 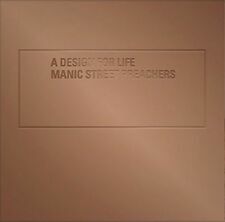 Manics scarce 7" limited edition Pink vinyl release of Life Becoming A Landslide E.P. b/w Comfort Comes. The condition of the sleeve is Near Mint with no tears, rips or seam wear and the vinyl is Near Mint and remains Unplayed. Also includes the original sleeve sticker. Please see the photos for more details. Check out my other Manics items, might be worth a look. Buy with confidence as I have a 99.8% positive feedback rating from 3000 music fans, mainly from fellow Manics fans. Will be sent in a 7" card mailer with two card stiffeners. Will combine shipping costs on multiple purchases and will refund once the items have been posted. Posting within the UK is by 1st Class Signed For. Worldwide shipping is by Tracked Or Signed, or both depending on your country. Thanks for looking. UK 7", Idealistic IDEAL 7001, 1997. Richey Is Dead. Sounds great record graded as Near Mint. Sleeve minor edge wear graded VG . Lots more records for sale. Can send one to three records for the price of one. A1 If You Tolerate This Your Children Will Be Next (Massive Attack Remix) 4:50. B If You Tolerate This Your Children Will Be Next (The Class Reunion Of The Sunset Marquis Mix) 10:02. The cover and contents suffer from folding, scuffing of edges, spine splits, discoloration, etc. Manic Street Preachers - Slash and Burn 7"
Manic Street Preachers - Slash and Burn 7", Mowtown Junk is the b side. Condition is Used. See images for condition. We're having a massive clearout, check out our other items. Side A: The Masses Against The Classes. Side B: The Masses Against The Classes. (Scarce White Label Promo). Planet Earth Records is run by Records Collectors for Record Collectors. Label: Epic. Condition: VG (The vinyl has a few surface marks. ). 12", 45 RPM, Single, Deluxe Edition, Limited Edition, Remastered, Special Edition. A Design For Life. A Design For Life (Stealth Sonic Orchestra Remix). Limited edition copper mirrored embossed sleeve artwork. LIMITED NUMBERED EDITION OF 480 COPIES ONLY - THIS ONE IS NUMBER 041 (SEE BOTTOM RIGHT CORNER OF REVERSE SLEEVE). This is a repress made by a fan club around 2001, limited to 480 copies and hand-numbered. The condition of the sleeve is Excellent with no seam splits or tears as New and both sides of the vinyl are Excellent plus. A Vision Of Dead Desire. 7" Issue with solid centre. Columbia Records 657724 7 UK 1991. Record looks in EX- Condition with light scuffs/hairlines. and plays EX both sides. You Love Us. Labels have no stickers or writing. In an individually numbered picture sleeve. Record Condition : Excellent. Grading as per UK Record Collectors' system. Record: 'EX'. Labels have creased on application to record (see pictures). Catalogue number: 6577247. LET ROBESON SING - THEE ELECTRORETRO CLUB MIX. LET ROBESON SING - THEE GLITZ MIX. Record Label : Columbia Records. Your Passion. It should be reminded that a record graded as excellent should not be confused with Mint or Near Mint and may have very fine or light marks or lines usually caused by sleeve rub. LIMITED NUMBERED EDITION - THIS ONE IS NUMBER 2090. Manic Street Preachers Roses In The Hospital 3 Track RED Vinyl 7"
Roses In The Hospital /us against you/donkeys. 7" VINYL PICTURE SLEEVE. SLEEVE & VINYL - VERY GOOD CONDITION. Record gradings are as follows B SIDE - WHAT HAPPENED TO THE BLUE GENERATION.